I didn't deliberately catch that light in the heart. I was a little stunned when I opened the photos from today seeing that there. I feel very good vibes when I look at it! Unfortunately ice still too. March has been a long month. I can still see the beauty in the snow and ice, even though it's slowly killing my life force. As always though, once I get out there in the fresh air and have been walking at a brisk pace for a while, all my worries go away, all my thoughts can run free, and everything looks more beautiful. Added bonus of sweating, makes it not even cold anymore! It's so beautiful once it's weathered. I wouldn't paint it for the world, or even fix it, until it was completely necessary. Couldn't have asked for a better cat, we are so grateful to have scored her. Won't talk about mouse updates though. I haven't seen ratty rat since yesterday afternoon. So, that's good. No mouse body though...so...no celebration yet. Thanks for coming with me yet again! 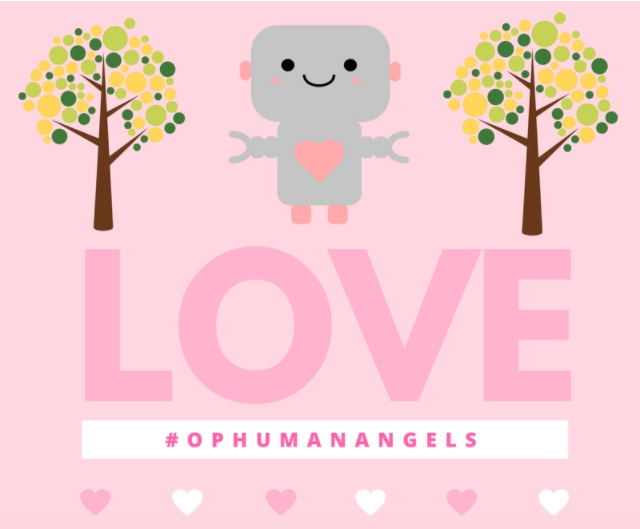 Join us in the #ophumanangels tag anytime. Are you still with that walking group? Beautiful walks you went on in the winter! 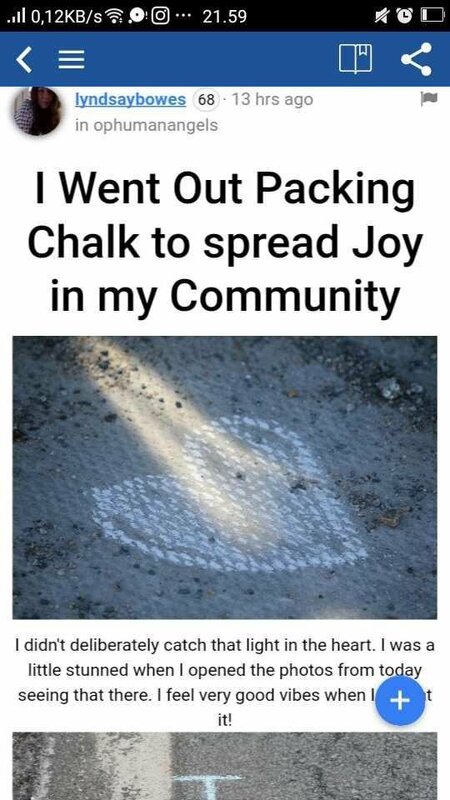 Nice chalking.. cool cat.. black cats are one of my favorites... they always want pet..
YAY chalk!! 💜 Smiling here now, thank you! 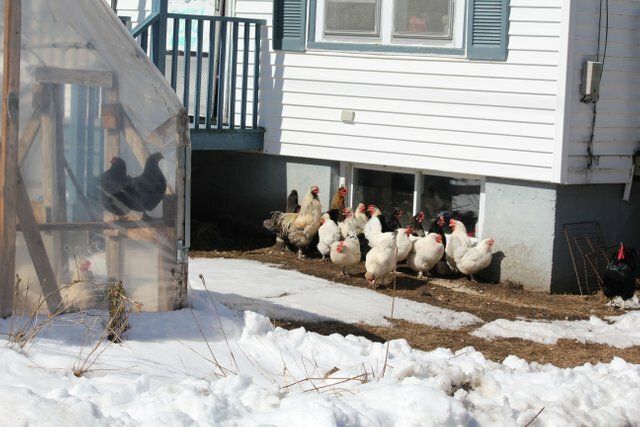 The #chickenbitchez look like they are peeping toms in that window, lol. What beautiful pictures of Edgar, and the crow! HAHAHAA!! YASSSS!!! We were raised on the same cartoons lololol!!!!! Thanks for the awesome flashback Phe!! The flock is looking so robust and healthy. I hope Mr Pendock is no more a pain? Hahaha, can a leopard change its spots? Edgar is beautiful and seems to be doing a great job with ratty ratty. Pendock seems to be behaving himself lately, fingers are crossed! I’m starting to think everyone in Canada are on steemit! Lol I’ve been watching schitts creek, is that a popular show up there? lol! should of known better. ITs a Canadian show and i always think of my steemit friends from Canada when i watch it. Love that photo of the heart with the sunlight! That is sending you a message Lyndsay! I really like old weathered wood. It has a special character. No paint necessary! It would spoil the effect. The ChickenBitchez are puddling again! Don't blame them though. When is the snow leaving? Edgar is looking very smug. You may not find a mouse corpse. My cats show me the dead body because they are proud of the job they do and I have had my cats a lot longer. Then they proceed to eat the mouse. A bit gross with all the crunching sounds. So maybe Edgar just ate the mouse! It's raining today so hopefully that will take care of the last patches of snow. Thanks for seeing the specialness of the heart photo, it's so surreal to me. Great walk, it's contagious, did one yesterday. Once again, I loved hanging out with you :) The "mural" photo for @pheonixwren came right after your sweet chalk drawings and for a tiny split second, I thought you were going to tell me you guys drew that haha (I'm obviously in need of some sleep;). It's true too, when you get outside and get moving, all concerns seem to just drift away. It's what exercise is really all about in my books! Edgar!! I see there are no worries about whether or not he's going to fit in hey? He appears to be the king of the 'indoor' castle ;) Geez he's a beautiful cat! Maybe he already ate Ratty Rat too, because he looks pretty darn pleased with himself...maybe it's just the cat post he scored! Every day here I go and feed the stray dogs in the neighbourhood and today I saw a cat come around the corner, then another, another, another...4 beauties who wanted absolutely nothing to do with me ;) The dogs love to see me come outside though...tonight they had leftover ribs! Nice walk and great little messages left for people; that really is a sweet idea. And, I do hope you get some spring soon! Aw, thanks for writing such a meaningful comment Lynn :) I'm glad you can resonate with the exercise thing, I need to get out more! Edgar may have eaten ratty rat, David suggested that we look through his poop for mouse teeth LOL!! I'm glad I have a teenage boy, he'll be up for the challenge lool!! What would the world be without teenage boys? That's so beautiful that you take care of the stray dogs in your neighbourhood....melts my heart!! You are a Human Angel!!! ugh exercise...even the word sounds like work! If you can walk with a friend and exercise without knowing it, well that's way better I'd say! hahaha look for teeth in poop!! I have two grown boys (20 and 23), but my god, they'd still be all over that!! I also taught high school for years and absolutely loved all the boys, but always had to be careful how I said that haha. It's the way they love life without giving two you-know-whats about what anyone thinks that warms my heart! Stealing is caring!! <3 <3 <3 <3 <3 I'll be looking for your blog, I think the #ophumanangels tag would suit your beautiful rescue missions!! <3 <3 Also, #thegoodnews. <3 <3 Thank you for being YOU Lynn!! <3 <3 You bring me a lot of hope. ...wait til you see the photo of the little pup; you're going to want me to steal him !! 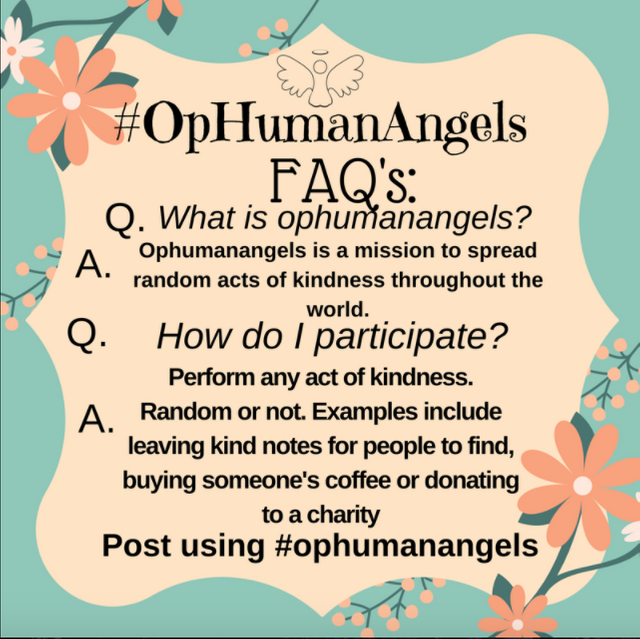 Wonderful Lyndsay, your kind actions with the tag #ophumanangels are surpassing the community in a very effective way. I followed this trend too and i am really thankful to you for this wonderful idea. You might have to find Edgar's mouse meal in the litter box. Look for the little mouse teeth. Wowww!! I will get Eddie to look hahahaa!! That would be intense if Edgar ate the mouse whole, don't cat's usually like to leave the body as a gift? ahhahaa!! Sometimes they do bring the prey to show you, but sometimes they don't. I have seen cats eat mice or rats. When they do eat it is mostly the same. The cat chews and crunches on the tip of the tail first, then the hinds always chewing and crunching until they get to the head. With the rats they sometimes leave the upper front teeth, but with the smaller mouse they eat it all I believe. Also look for signs of the mouse or rat hair. The hair usually can't get digested that fast so it goes right through. There are so many beautiful places, like water, chickens, seagulls and everything is very eye-catching, I can not handle it, I think everything is amazing ..
@lyndsaybowes, Thanks for showing powerful strength today via stronger photography and stronger contexts. Edgar and #chickenbitches giving me most happiness. I'm glad to see your clicks today morning to me. Nice heart sign here. Gorgeous painting of Museum. The water seems froze looks. Birds enjoying on the rocks near water. Nice you decided to share. Thanks, do you have any idea what the light beams on the heart are? What have you been up to? Gardening? he, I'm trying to learn to plant in the garden to earn money as a necessity of life. Thank you @lyndsaybowes for giving us a positive energy here in Steemit. light in the heart...angel feet. 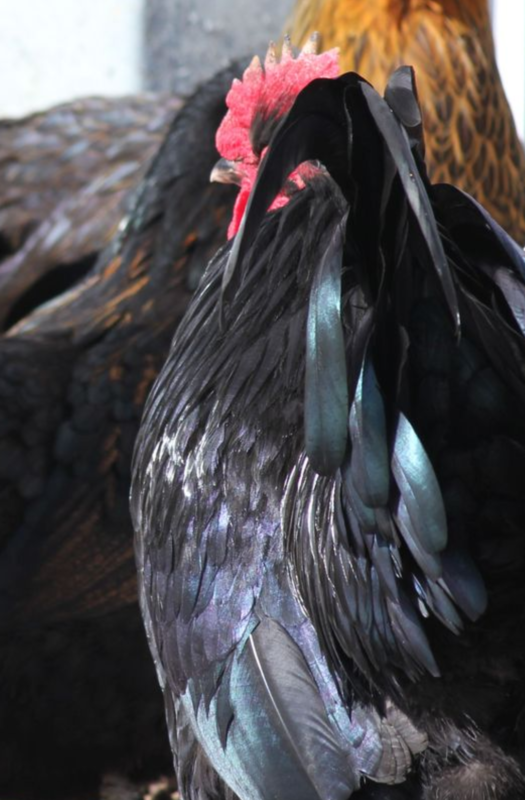 @lyndsaybowes your photography is best espacially hens . I like this picture . I appriciate your photography skill . Thanks for sharing a nice photography. You copied David's comment and added a totally irrelevant meme. Downvoted.